Scraper bikes are integral to life for East Oakland kids. Who would want to take away a kid's bicycle? Evidently, San Leandro police. In much of the Bay Area, bike riding is viewed as being good. It's healthy exercise and it benefits the environment. So, cities increasingly encourage and accommodate bike riders on streets and roadways. In San Leandro, however, this seems only to apply to wealthy riders, not teens from nearby East Oakland. 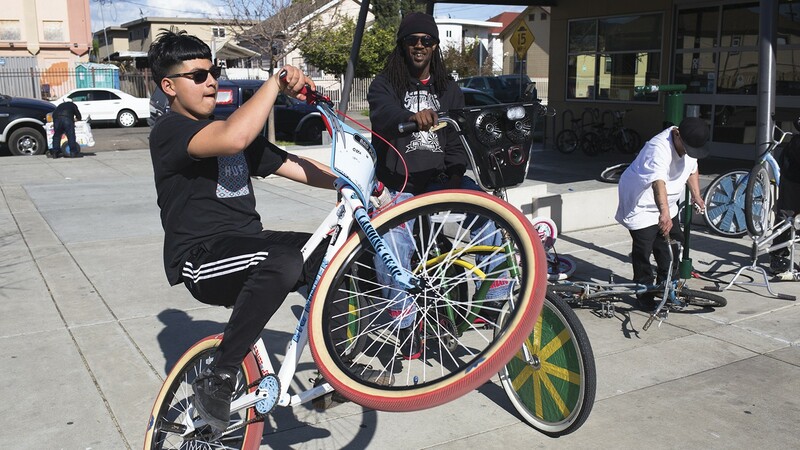 In East Oakland, bikes are something different, especially among youth. There, bikes are a vehicle for personal expression and a ticket to getting out of the house, going to the library, or meeting with friends. Instead of simply riding to the corner store, East Oakland kids may pedal to school, doctors' appointments, or BART. Their streets are also not lined with protected bike lanes, and the only bicycle repair shops that are able to help them are as far west and north as the "30s" (west and north of 40th Avenue) and as far east as Vic's Bikes in San Leandro. Because bikes are so integral to life for kids in East Oakland, the local culture has evolved to embrace the decoration and customization of them. Kids line spokes with foil, wrap electrical tape around their frames, and generally act like skater punks but with BMX bikes. They roam in groups, pulling tricks in parking lots, and learn to fix their mechanical problems together. But the freedom that these bikes represent for teenagers in East Oakland stops dead at the San Leandro border. Once a teen on a BMX bike enters the city limits, they are likely to be targeted by police, kids say. Elijah, 15, is the sort of young man whom middle America might want to meet coming out of East Oakland: He goes to school, is respectful of his peers and teachers, and spends his off hours at the 81st Avenue Library branch of the Oakland Public Library. He's been a regular there for years, and the security guard at this branch, Jason Wilkinson, says Elijah was the first participant and winner of a Connect Four tournament that the pair organized. Wilkinson is a bit of a big brother to the kids at the 81st Avenue branch: If they get out of hand, he knows their grandparents, mothers, fathers, sisters, and brothers and can call any of them. At the 81st Avenue branch, Wilkinson is the law. He grew up in the neighborhood and knows everyone. R.B., on the other hand, is the 81st Avenue branch's bicycle whisperer. He's the COO of the Scraper Bike Team, a group founded in 2008 by Avery Pitman Jr. and Baby Champ to promote East Oakland bike culture. R.B. remembers seeing the group's founders holding court with bike kids. "I remember Avery Pitman Jr. standing at the top of his stairs, giving T-shirts to kids with nice bikes," R.B. said. "It was all about getting active in your community in a positive way." The bike group takes its name from the Trunk Boiz song, "Scraper Bike." Pitman was killed by a stray bullet from a driveby two years ago, and since that time, R.B. has taken on the task of building something positive for East Oakland kids. Elijah was one of those kids, and he saved his money last summer to buy the bike of his dreams: a fully loaded 26-inch Haro BMX. It was his first bike. Unfortunately, he rode it to San Leandro with a few of his friends, and officer Anthony Pantoja took it away. Pantoja grabbed Elijah out of a pack of kids and cited him for alleged reckless driving, according to a police report of the incident. Other kids at the 81st Avenue branch tell similar stories. The Express spoke to four youth who had their bikes taken by SLPD, with one being returned months later. Another 10 kids in their extended circle have also had their bikes taken by San Leandro police, according to R.B., Elijah, and Wilkinson. The stories told by these kids are troubling: Cops would sometimes open the doors of their police cruisers just as kids go by, knocking them off their bikes. Or, police allegedly pulled their guns and held a group of kids at gunpoint. One said an officer ran after his friend and tackled him off his moving bicycle in the Wells Fargo parking lot off East 14th Street. The kids said San Leandro police officers also sometimes said they were going to give the nice scraper bikes that they confiscated from Oakland youth to their own children. San Leandro police officials did not respond to multiple calls and emails seeking comment for this report. The kids said they think police are taking their bikes because they suspect they've been stolen or that the youth aren't obeying traffic laws. The youth interviewed by the Express all said that they had registered their bikes online, and yet San Leandro police took their rides away. Many of the kids' BMX bikes look as though they've been through hell. Performing tricks means breaking parts, taping things together, and generally turning your bike into a hard-core work of art to demonstrate how tough you are: much like a skateboarder. When these teens ride through the streets of Oakland, said R.B., Oakland police typically wave at them and say, "Hi!" Their goal is to be looked at, as kids pop wheelies and do tricks for passersby. As for safety and traffic laws, R.B. advocates for assigning kids training hours, community service, and bike safety courses, rather than having police take the bikes they've often worked so hard to earn or build. R.B. said San Leandro is not being honest with Oakland youth. He cites a 300-plus page San Leandro Bicycle and Pedestrian Safety Master Plan, which doesn't state anything about taking kids' bikes. Instead, the report advocates for training and teaching delinquent bike riders about bike safety and traffic signals. And that's R.B. 's specialty: He's offered to teach classes to kids who've been ticketed and has already taught safety to kids like Elijah. He said he's tried to reach out to San Leandro police and city officials but has had no luck discussing the problems. In the meantime, the Scraper Bikes Team has replaced Elijah's bike with a loaner. But nothing will replace the brand new Haro he worked so long to buy. Correction: The original version of this report mistakenly stated that the Scraper Bike Team hangs out at the 81st Street library branch. It's the 81st Avenue branch.